Honey-Lemon Face Pack: Mix a tablespoon of honey and lemon juice together. Apply this on your face and neck, leave it on for 15 minutes, and rinse off. 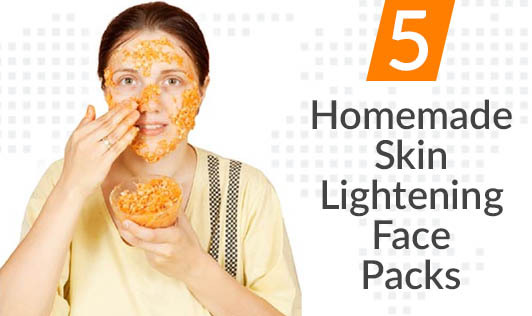 Gram Flour Face Pack: Mix 2 tablespoons of gram flour, a pinch of turmeric powder, and just enough milk to mix in a bowl. Make a thick paste and apply on the face and neck. Leave it on for 15 to 20 minutes and wash once the pack dries. You can also add a few drops of lemon juice in case you have an oily skin. Milk Powder Face Pack: Mix a teaspoon of milk powder, honey, and lemon juice together and apply the mixture on your face and neck. Leave on for 10 minutes and wash it off. Cucumber & Lemon Juice Face Pack: Mix a teaspoon of cucumber and lemon juice together, apply it on your face and neck for 15 minutes and wash off. Tomato & Gram Flour Face Pack: Take 2 teaspoons of gram flour in a bowl. Add 2 to 3 teaspoons of tomato juice and mix well to make a fine paste. Apply the paste on your face and neck and leave it on for 15 minutes and rinse off. All the above face packs are very easy to make and use. You just need 2 or 3 ingredients which are also easily available in your kitchen. So, don’t get lazy! Go ahead and pamper your skin with these natural face packs.